Unaffordability has been associated with Toronto’s real estate market for the past few years, the culmination of which is the fewest new home sales in nearly two decades. There were only slightly more than 25,000 new home sales recorded in the Greater Toronto Area last year, according to Altus Group, which says that is the lowest total in 18 years. The 21,330 new condo sales were down 38% last year, and single-family detached houses declined a whopping 50% with 3,841 sales. The Building Industry and Land Development Association’s CEO says that indicates an imbalanced market and the government should seriously reconsider B-20. He also says that first-time homebuyers need relief. A major reason for the downturn, according to the CEO of Canada Mortgage & Financial Group, is that policymakers have scared off international investors whose money the housing market and the Canadian economy rely upon heavily. While B-20 is the biggest culprit of the market’s downturn, tax amendments might help spark a healthy sales cycle, she added. 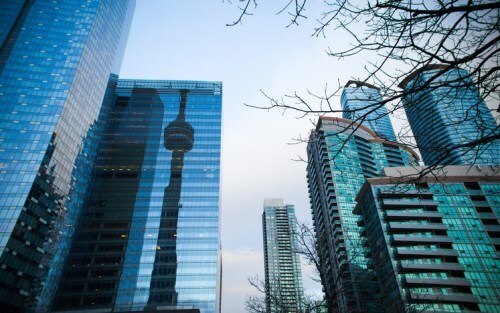 It can be argued that the cost of real estate in the GTA isn’t especially prohibitive, but in tandem with a 200 basis point stress test, not to mention interest rate hikes, qualification has become arduous. However, most rankling to Ameerullah is watching borrowers at the mercy of their lenders. Instead, BILD should advise builders to reduce their markup. Why suggest other agencies to revise their policies and rules. Why would you want people to get into 30 years mortgage? What red tape; whatever projects came to existence is not selling, then what? Builders cancelling projects and ditching people, why don't you talk about that? It can also be argued that Canadians have record breaking 175% of their income in debt, so maybe these greedy industry folks can step back and let policy makers do what's necessary to try and bring things back under control. It certainly won't help them if the whole thing crashes down in a ball of flames like it did in the 90s. Mani, you bring up an interesting point. In all the hype about the price of new and used housing, the profit that builders make or don't make never seems to come up as topic of discussion. Of course it is up to the builder to be profitable, otherwise they would go out of business, no? Are there any other businesses that are 'mark-up' regulated? I don't know. I guess the only reason a borrow would want a 30 year versus 25 year amortization period, is to lower their monthly payment. The length of the mortgage at the initial interest rate would only be a term of 5 years or less. My beef is not with the consumer it is with the regulators, I really don't appreciate the government dictating to me, the lenders and consumers how much and under what criteria they can borrow money. Are Canadians not capable of making sound, critical thinking decisions and need someone else to tell them what is at financial risk? I am not aware of any new housing not selling in the GTA? If there are, then it simply means it is over priced.